The BHS-Series are shock-resistant thermal imaging cameras. They produce a crisp image in the darkest of nights. With the BHS-Series security professionals and law enforcement officers can see suspects in total darkness, through smoke, and light foliage. The BHS-Series are bi-oculars. This means that it is less tiring to use for the eyes than a monocular. By using a bi-ocular the ability to detect faint objects is enhanced. This means that you have more chance to detect small objects against the background. It is also easier to hold bi-oculars steady when looking at an object. An advantage if you are looking at small things which are far away. The BHS-X is equipped with an uncooled vanadium oxide detector. 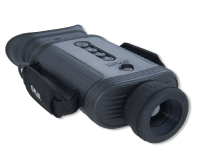 This provides excellent long range viewing with sharp 320 × 240 native resolution in the viewfinder and a 2× digital e-zoom step to 160 × 120 resolution. Powered by FLIR’s 640 × 480 core, the BHS-XR delivers greater range performance with crisp, clear 320 × 240 native resolution in the viewfinder AND while in the 2x digital e-zoom mode, plus an additional 4× digital e-zoom step to 160 × 120 resolution. Full 640 × 480 resolution imagery from the BHS-XR Series is also accessible via the "aux video" jack in the hot shoe. The BHS-Series can be ordered with different lenses. Longer lenses have a narrower field of view and allow you to see targets farther away. Lenses are interchangeable. The specific lens(es) you require for your application need to be specified at time of order. The BHS-X comes with a 2x digital zoom. The BHS-XR has both a 2x and a 4x digital zoom. This allows you to have a closer look at the situation when necessary. Weighing just under 1000 grams, batteries included, the FLIR BHS-Series are compact and extremely light systems. They are IP67 rated and operate between -20°C and +60°C. Ergonomic and easy-to-use, the BHS-Series are fully controlled with just 5 buttons on top of the unit. In operation, the BHS-Series are totally silent units. Eyebrow style light shield eye-pieces allows the operator to remain fully covert, in total darkness. Just press a button and start recording thermal video on a removable SD card. Both versions of the BHS-Series allow to store thermal images in JPEG format on a removable SD card. Images can be used as evidence. The battery compartment hides 4 rechargeable AA NiMH batteries. Good for 4 hours continuous operation. The BHS-Series can also run on standard commercial off the shelf non-rechargeable Alkaline or Lithium Ion AA-batteries. The BHS-Series come standard with a “hot shoe” which can easily be attached to the camera. It allows to charge the camera and connect the camera to an external video monitor while the camera is mounted on a tripod.